When I moved to Colorado twelve years ago, I was still shooting strictly with film. I had a 35mm system, a few medium format systems and a 4×5 press camera system. Lugging the medium formats up into the mountains was not my favorite thing. Just thinking about it makes my back hurt. 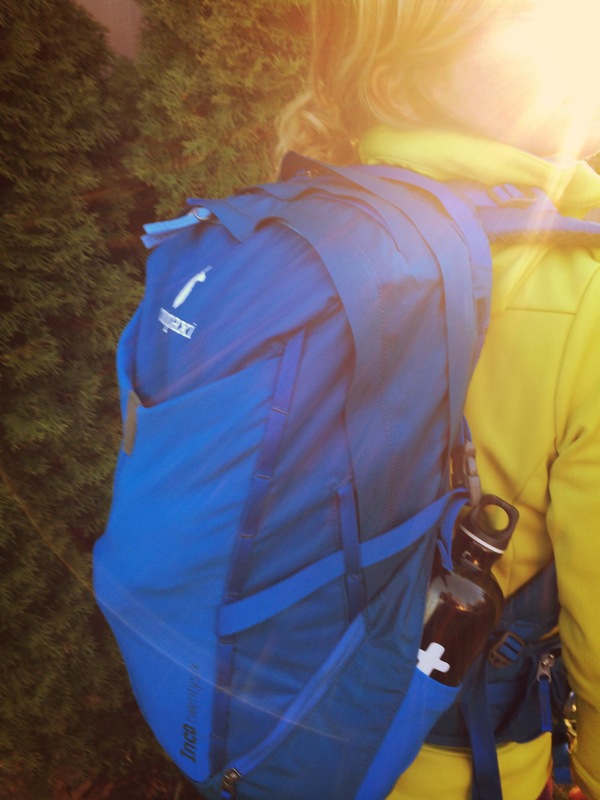 In those days, I would wrap my gear in capilene t-shirts and stash them at the top of a sturdy daypack or an overnight pack. Since then, I’ve always been on the lookout for ways to improve my camera pack systems. I still use the 4×5, but most of the time I’m shooting with my DSLR. 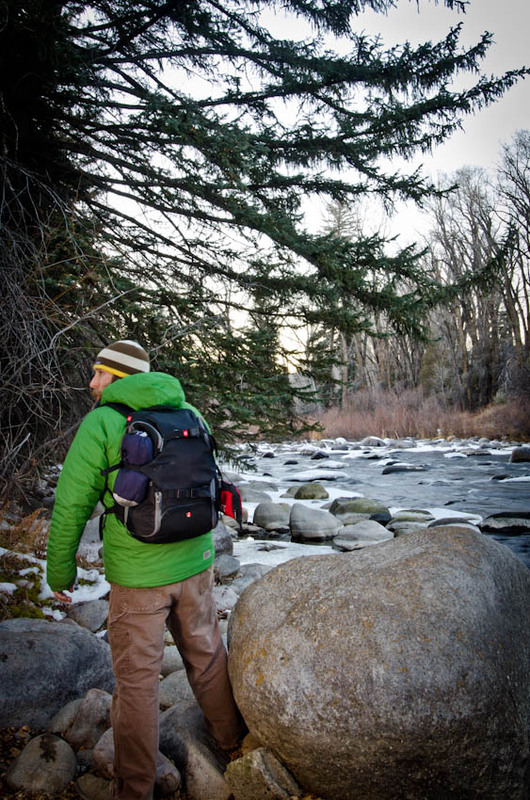 My go-to pack for the past few seasons is a combination camera bag and backcountry backpack. It’s great, and it fits a lot of gear in addition to camera equipment. But sometimes it’s a little too much for small day shoots and outdoor events. 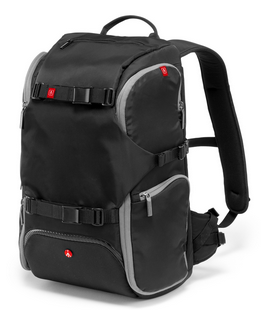 Over the past two months, my go-to pack has been the Manfrotto Advanced Travel Backpack. I’ve used Manfrotto tripods for years and have come to rely on their durability, as I tend to beat the hell out of ‘em here in the mountains. I took the pack out for a number of day trips in Colorado’s White River National Forest this fall and have now adopted it as my everyday pack. It’s a perfect hybrid system that works for simple day shoots, but can also be pushed to its limits on backcountry day shoots. 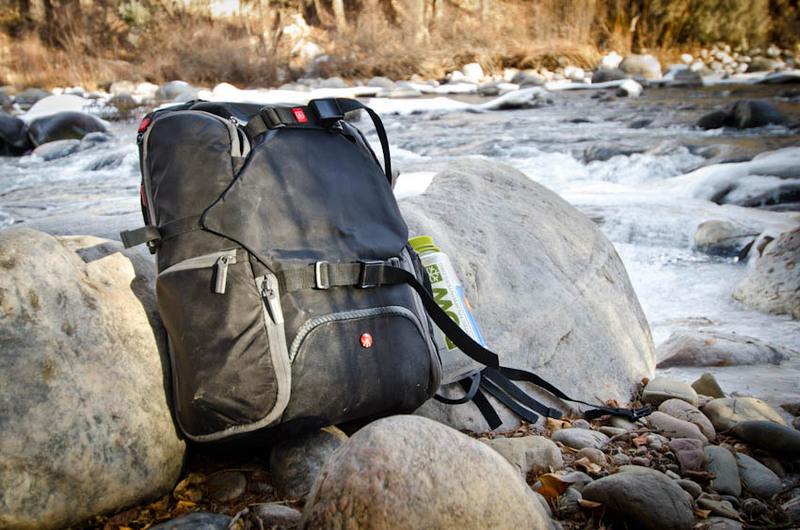 The pack’s exterior dimensions are 18.9”H x 11.8”W x 9.1”D (48 x 30 x 23 cm), and it weighs 3.1 lb (1.4 kg). 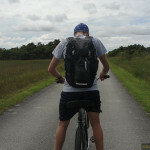 It features locking adjustable straps along the back for a small tripod. The main compartment is located on the side of the pack, and there are inner pockets and adjustable velcro pieces to create smaller customized compartments. Manfrotto advertises the ability to carry a lens attached camera, 1-2 additional lenses, a flash and additional accessories. It’s no joke – I easily fit a camera body with a 12-24mm lens attached, a 70-200mm lens, a 50mm lens, a 28mm lens, a GoPro Hero 3, two PocketWizards and their cables, a speedlight and its accessories, filters, extra batteries, a snoot, flags, gaffers tape and additional cords. With so much stashed away, I liked that the inner pockets are zippered mesh so that you can easily spot what you need without too much digging. 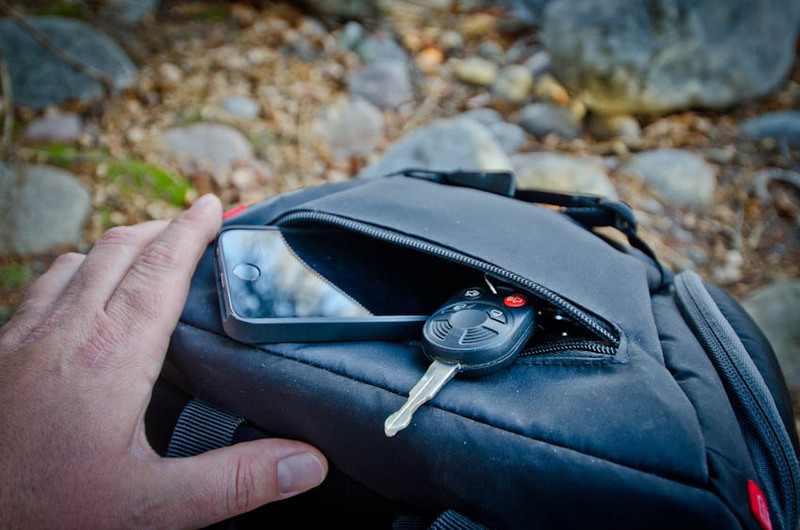 The pack features a small top pocket for essentials like my phone and keys. There’s also a pocket for storage along the back that’s perfect for holding a tablet, 13” laptop, topo maps, wilderness guides or even a copy of My First Summer in the Sierra. On the opposite side of the pack, a zipper pocket allows you to expand the storage out to fit a small tripod and/or a small light umbrella (or even two) for location lighting. It’s also a great spot to stash a thermos of your favorite beverage to warm up on cold shoots – just watch out you don’t get the inner material caught in the zipper like I did. Using the Manfrotto Advanced Travel Backpack on several day trips into Colorado’s Wilderness Areas, I pushed it beyond what it’s designed for, but it didn’t break. With a simple system of camera equipment stored, I still had room to stash some very basic survival gear in case things went south. I used the adjustable straps along the back to secure a light tripod as well as a hooded down jacket. I slid silk weight capilene pants and a long sleeve shirt along with gloves and a hat in the rear lumbar pocket. 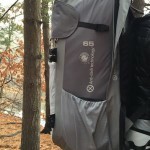 The adjustable straps on both sides of the pack worked well for clipping in my water bottle and an emergency bivy. I crammed a small first aid kit, headlamp, water filter, trail mix, an apple and a block of Irish Cheddar into the expandable side pocket. 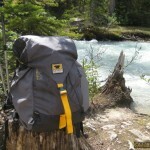 The pack also comes with a rain fly to keep out the elements, which for me is crucial. After pushing the pack to its brink, I’d say upgrading the waist and chest straps to a heftier size would definitely add to the overall comfort of the pack. I’m not a huge fan of the zipper pulls and have a feeling that, if I keep abusing this pack, those will be the first things I’ll need to fix. 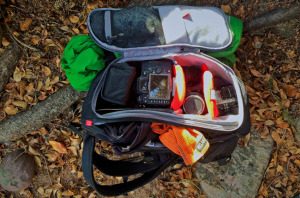 Despite these issues, the pack’s lightweight, compact design paired with its versatile storage system make it easy to always carry a small but effective DSLR system with me. Definitely worth the $149.99 MSRP investment. I look forward to using it on a number of upcoming shoots for The Lodgepole Project as well as the 2015 Burton US Open. 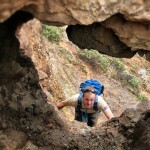 Steven DeWitt is a Colorado based outdoor adventure and conservation photographer. 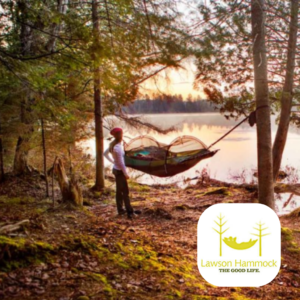 A native New Englander, he creates compelling visual stories of adventure in the Natural World that help reconnect us to wilderness, remind us what's at stake and inspire hope.